Music of the French Revolution – Tribute of the world – Europe. Davaux: Symphony concertante in G major mixed with patriotic airs. Cambini: Six patriotic airs with variations for two violins. Kreutzer: Duet for two violins in B-flat major. Here is one of those not so abundant programs that were published in the wake (or in anticipation) of the bicentennial of the French Revolution. 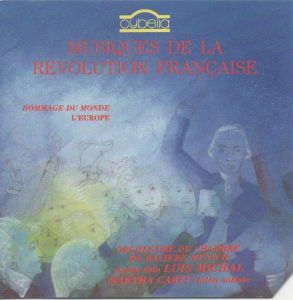 I’ve reviewed a few others in the same vein, like Claude Pichaureau’s Les Grands Hymnes Revolutionnaires on Erato Musifrance 245 006-2 or 2292 45006-2 (1990), Michel Plasson’s Revolution Francaise / Music of The French Revolution on EMI CDC 7 49470 2 (1988), Concerto Köln’s La Prise De La Bastille on Capriccio 10 280 (1989), Jean-Claude Malgoire’s Chantons La Revolution on CBS CDCBS 54607 (1989) or the much-flawed Révolution aux Choeurs on Adda 590018 (1989). 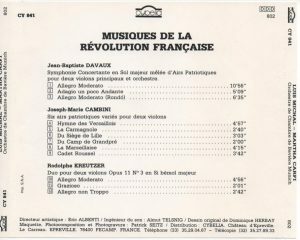 There’s another similar one on the same label Cybelia, CY 840, which I haven’t heard, Musiques de la Revolution Francaise: Les Chants De Marianne, a program of patriotic songs. This one features the same Symphonie Concertante mixed with Patriotic Airs for two violins and orchestra of Jean-Baptiste Davaux that is on the Concerto Köln disc, Joseph-Maria Cambini’s Six Patriotic Airs with Variations for Two Violins and Rodolphe Kreutzer’s Duet for Two Violins op. 11-3, for an acceptable TT of 52:57. No barcode, which makes the CD somewhat difficult to find on your customary commercial website. I was even surprised to find it listed at all under Amazon.com (ASIN B008Z7CLQG). The program’s main interest is the Davaux Symphonie Concertante. It is a charming work, written in a galant style far removed from the turmoil of the revolutionary spirit, but also a real composition, with the revolutionary airs – mainly, The Marseillaise in the first movement and the songs La Carmagnole, Cadet Roussel and Ah ça ira in the Finale – treated and varied very seriously, as any serious composer of the era would have done with any theme that he could have chosen as a basis for his development. The two other works for solo violin duet are, because of the very medium, somewhat dryer and less original, although it is again fun to hear how Cambini varies those very same Revolutionary Airs, known (Carmagnole, Marseillaise, Cadet Roussel) or forgotten (Hymne des Versaillais, Siège de Lille, Camp d Grandpré). Soloists Luis Michal and Martha Carfi and the Munich Chamber Orchestra (playing at modern pitch, unlike Concerto Köln), acquit themselves excellently, with slightly less drive and gusto than Concerto Köln in the first movement but slightly more robustness and less fussiness overall, more vivid presence and better stereo separation of both violins, ultimately lending their interpretation more impact than Concerto Köln’s. That said, the program of Concerto Köln is more attractive (with symphonies of François Martin, Gossec, and a great one attributed to Dittersdorf but that turns out to be by a mysterious Othon-Joseph Vandenbroecke, 1759-1832), and you don’t absolutely need to have two different versions of Davaux’s Symphonie, unless you are a staunch French patriot and obsessive collector of everything related to the Marseillaise.